Preheat grill to medium heat. If you’re using charcoal, prepare a section of the grill for indirect heat. 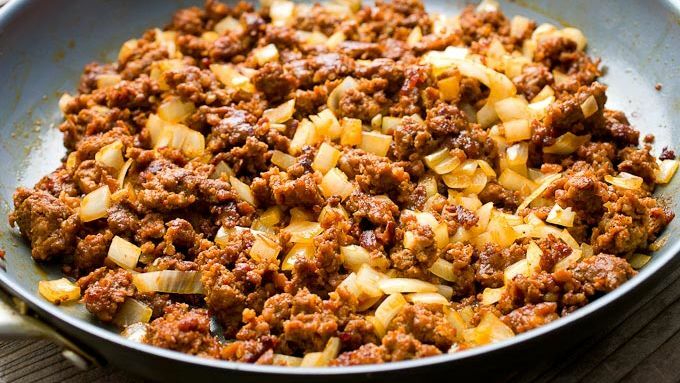 In a medium skillet, add chorizo and cook over medium heat until cooked through and browned, 6-7 minutes. Add diced onion and cook for another minute or two until onion is softened. In a separate skillet or small pot, heat refried beans with butter over low heat. Keep warm. In a grill pan, spread out a layer of Food Should Taste Good™ Sweet Potato Chips. Top with half the chorizo, dot chips with warm refried beans, and top with crumbled queso fresco, diced tomatoes, pickled jalapenos, and cilantro. 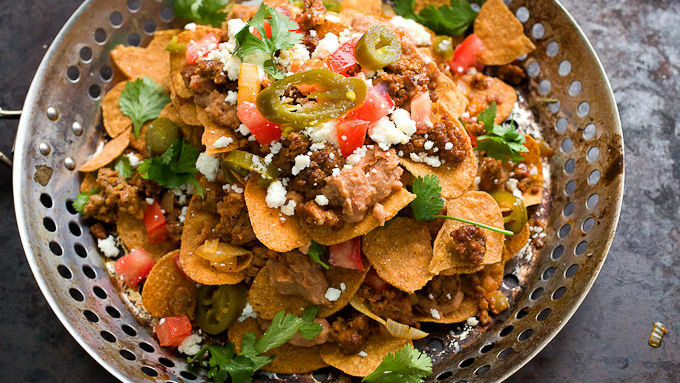 Repeat with a second layer of chips and toppings, piling the nachos high. Place grill pan on grill (over indirect heat), cover, and cook for 8-10 minutes until chips are warm. Some on the bottom might even be browned a bit. Topping should be hot and bubbling. Cut the avocado in half and remove the pit. Grill the avocado, cut-side down. Warm avocado is creamy and wonderful on nachos! An easy way to make a plate of nachos outside! I love serving up a hot platter of nachos as much as the next guy, but as the weather heats up, it’s less appealing to crank up the oven and heat up the house. Don’t get me wrong, I’ll do it. But, I’d rather sit outside and let my grill do the work. But nachos are happening, so they might as well happen on the grill! Of course, you could top these suckers with anything, but I love keeping the toppings simple and flavorful. For starters, I like big refried bean dollops on my nachos. The refried beans almost act as a sauce as they heat up. Good stuff. I just use canned refried beans and add a little butter to them over low heat. They become creamy and delicious after a few minutes. For protein, I like to add spicy chorizo. It has loads of spice to it so you don’t need to worry about adding other spices. Of course, other toppings are up to you, but I like some diced fresh tomato, crumbled queso fresco (some sort of cheese is a must), pickled jalapeños, and fresh cilantro. For chips, I used Food Should Taste Good Sweet Potato Tortilla Chips which end up being a little sweet. The sweetness pairs perfectly with the spicy chorizo. Stick the nachos on a hot grill, covered, for about 8 minutes until the fillings are hot and the chips are toasted. You can also grill an avocado for additional toppings. 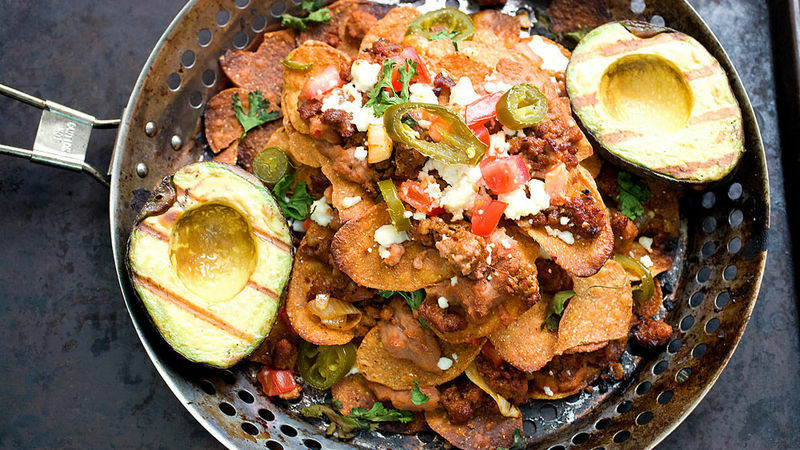 The warm avocado is perfect on the nachos. 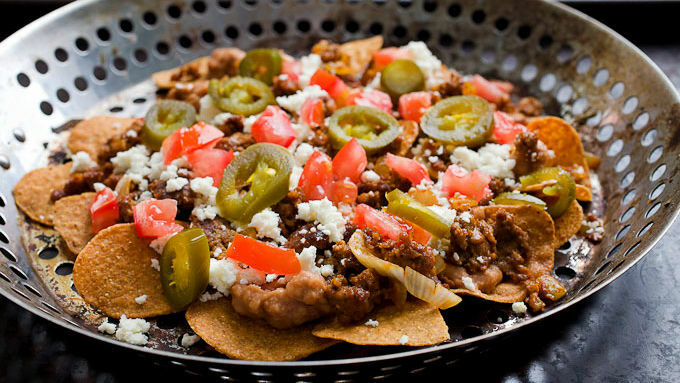 Don’t let the hot weather stop you from making a perfect plate of tasty nachos!